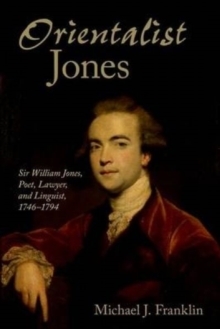 Sir William Jones (1746-94) was the foremost Orientalist of his generation and one of the greatest intellectual navigators of all time. He re-drew the map of European thought. 'Orientalist' Jones was an extraordinary man and an intensely colourful figure. At the age of twenty-six, Jones was elected to Dr Johnson's Literary Club, on terms of intimacy with the metropolitan luminaries of the day. The names of his friends in Britain and India present a roll-call of lateeighteenth-century glitterati: Samuel Johnson and James Boswell, Sir Joshua Reynolds, Benjamin Franklin, Joseph Priestley, Edmund Burke, Warren Hastings, Johannes Zoffany, Edward Gibbon, Oliver Goldsmith, Richard Brinsley Sheridan, Charles James Fox, William Pitt, and David Garrick. In Bengal his Sanskrit researches marked the beginning of Indo-European comparative grammar, and modern comparative-historical linguistics, of Indology, and the disciplines of comparative literature, philology, mythology, and law. He did more than any other writer to destroy Eurocentric prejudice, reshaping Western perceptions of India and the Orient. His commitment to the translation of culture, a multiculturalism fascinated as much by similitude as difference, profoundly influenced Europeanand British Romanticism, offering the West disconcerting new relationships and disorienting orientations. Jones's translation of the Hindu myth of Sakuntala (1789) led to an Oriental renaissance in the West and cultural revolution in India. Remembered with great affection throughout the subcontinent as a man who facilitated India's cultural assimilation into the modern world, Jones helped to build India's future on the immensity, sophistication, and pluralism of its past. Michael J. Franklin's extensive archival research reveals new insights into this radical intellectual: a figure characterized by Goethe as 'a far-seeing man, he seeks to connect the unknown to the known', and described by Dr Johnson as 'the most enlightened of the sons of men'. Unpublished poems and new letters shed fresh light upon Jones in rare moments of relaxation, while Franklin's research of the legal documents in the courts of the King's Bench, the Carmarthen circuit, and the SupremeCourt of Bengal illustrates his passion for social justice, his legal acumen, and his principled independence.